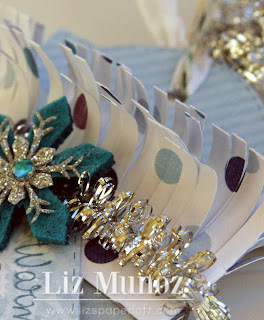 Liz's Paper Loft: MCT 12 Days of Christmas Day 11 ~ Tag & Gift Card Holder! 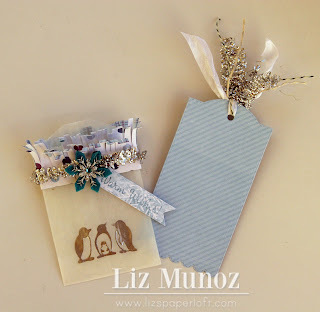 MCT 12 Days of Christmas Day 11 ~ Tag & Gift Card Holder! Hi Everyone! Oh my, I can't believe that My Creative Time's 12 Days of Christmas is coming to an end! If you're like me, then I know you've gotten some great ideas from my design teammates! I don't want to keep you too long so I'm getting right to my project! The peeps in my family love getting gift cards, however, I love to wrap presents. So this is my way of wrapping a gift card! sorry the lighting is sooo bad!!!! Since the glassine bags are not opaque, I like to write and attached the gift card to the back of the tag with a bit of ATG adhesive. Your gift card idea is so cool I love it I know what you mean I love wrapping gifts too kinda boring with gift cards so I love your idea to keep it fun gosh you sure are one talented and creative gal thanks for sharing!! HI Love your gift card very pretty. I'm like you, the love to get the GC's but I need to make them pretty. And it's fun to find unique ways to gift an otherwise boring gift. Really pretty!! I love what you did to the bag, really makes it a gift!! You make the most beautiful projects, Liz! I LOVE this!!! So pretty! LOVE all the tinsel!!! Your gift card wrapping is a gift all on its own! Beautiful! Thank you for sharing and inspiring. Very cute project! Great way to decorate a gift card for giving. TFS! Liz ~ Oh my WORD!!! This is GORGEOUS!! Simply GORGEOSU!! I think the detail are so sparkly and fun!!! So elegant to! not sure if there are enough words here to say how much I ADORE it! I LOVE that you used the glassine bags and then you can see the tag slightly!! I am so stealing ~ oops I mean borrowing this idea ~ if I EVER get to making tags!! LOL! We are so with you on the gift card thing! BEAUTIFUL creation as always! Wow, what a great idea! This is so pretty. Thanks for sharing. 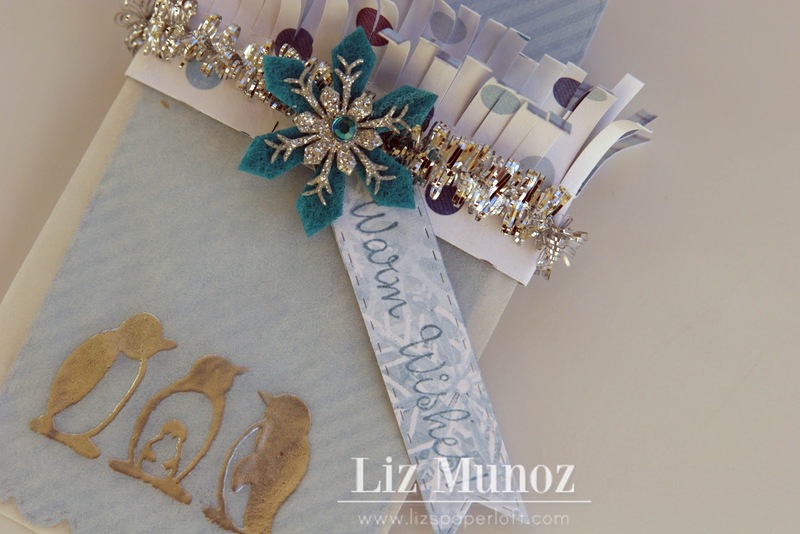 Wow, what a beautiful and elegant Christmas Tag, thanks for sharing. This is such a pretty way to display and give giftcards. 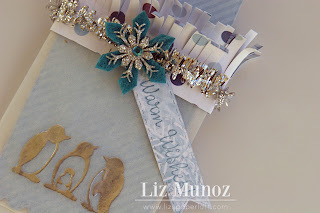 Your tag is so beautiful and can be reused! I love it...Great job! OMG! 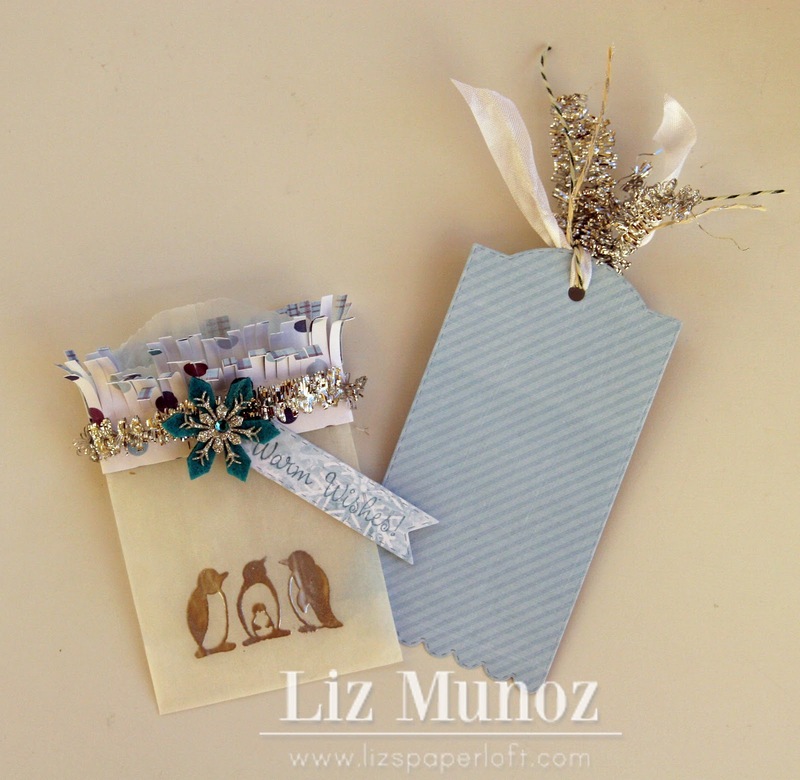 Love your gift card tag/holder! You are so creative Liz! It's so BEAUTIFUL! Thank you for the inspiration and sharing your GORGEOUS project :). Have a Wonderful day! Love what you did to make the gift card holder. I especially like the fringed paper. ohhhh this is so pretty Liz!! 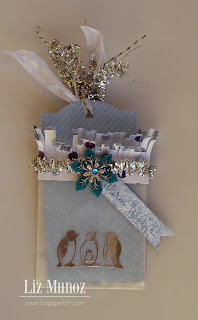 great embellishing of this fun gift idea!! Very pretty & shimmery!! (Is that a word?) Love it! Very pretty way to give a gift card! This is so pretty. I love all of your embellishments. Very nice. TFS another nice way to present a gift card this holiday season. Love your blingy gift card holder. 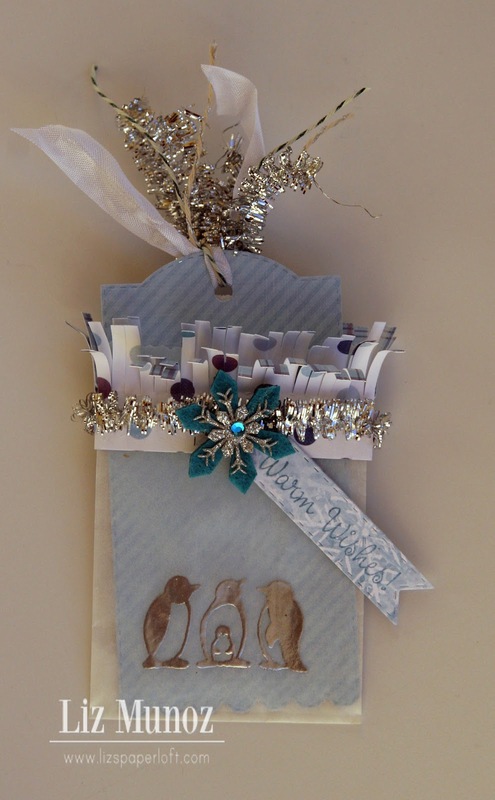 Wow, your little penguins are the cutest and such fabulous embellishments! Fantastic! Very nicely done, love the colors! 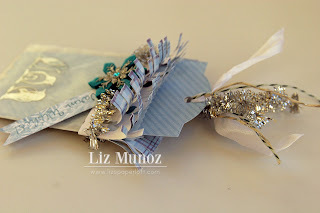 Cute tag and what a great idea to make a little bag holder for it. Sooo pretty the cute little penguins are just adorable.